Ed and his wife dropped in on some friends to catch up on their adult children who were home for a visit. As they left, he sat in the car for a moment, then banged the steering wheel in frustration. Besides the obvious Eternity factor, these parents lost sight of one of their most crucial functions: helping their children to discover God’s purpose for their lives. Obviously, parents don’t entirely control this process, but they are certainly placed by God as the gatekeepers to shepherd it to fruition in the lives of their children. Paul especially singles out fathers: “Fathers, do not provoke your children to anger, but bring them up in the discipline and instruction of the Lord” (Ephesians 6:4). Leading them to pursue maturity in God’s wisdom; cherishing and training them by example, and bringing discipline are all part of the process. Our appetites are shaped from birth. Hence, today’s concern to cultivate children’s appetites for healthy and nourishing foods. But how we are shaping our children’s spiritual, mental, emotional, and moral appetites and interests? Not so long ago, a parent’s greatest fear was that their child might wander through life with no direction or purpose. They knew their influence was required to guide and groom their sons and daughters from childhood to maturity to a career they could pursue with passion and dedication. In an age that enthrones Self and tells children to live their own “truth,” Secular Humanism declares each person their own god, and that every idea or impulse, no matter how foolish or selfish, has equal value. History will record that millions of families were destroyed as the self-proclaimed experts came on the scene to trade in God’s foundations of traditional marriage and biblical parenting for novel notions of social engineering. God’s unchanging dynamic for child rearing is enshrined in the wisdom of Proverbs 22:6: “Train up a child in the way he should go; even when he is old he will not depart from it.” Too many have taken this verse to mean that if I bring my kids to church and Sunday school, then they’ll follow the Lord later in life. When this is not the case, many parents feel that God has let them down. But this promise is predicated first on training: Train up a child. The word used here means narrow. It presupposes the presence of a gate and a gatekeeper, as opposed to no boundaries and limitless freedom. “In the way he should go” is rooted in the word for speech, or communication. Parents must hear, study, and be attuned to the unique “bents” – for good and bad – in each child’s life, talents, and personality – to discover where and for what God has uniquely suited them. The romantic notion that any path in life is fine if “you just do you” may make for good pop music, but it makes for horrible life choices. Worldly influences today are more aggressively hostile to biblical family norms than ever before and have far more access to our families via the Internet, social media, smart phones, television, gaming, Netflix, Hulu, and YouTube. When I was growing up, we often went out and left our doors unlocked. That would be unthinkable today, but the greater question is, are you guarding these other portals into your home? Have you forfeited your influence over your kids? Rest assured, there is a multi-billion-dollar entertainment and advertising industry that has no such reservations and is more than willing to fill that void. Neither can you casually and confidently send your kids off to school, because the secular humanist educational system is plotting to shipwreck godly input, substituting godless fallacies that promote wayward living. Thank God for those willing to swim against the tide to teach the truth, but by and large today’s schools are more committed to indoctrinating children than educating them. Rather than simply insulating our kids from outside influences, we must deliberately and continually inoculate them with godly, spiritual influence. Loving God and pursuing His purpose comes not just from a sermon at church, but also from diligent teaching at home. It is to be woven into the fabric of normal, everyday living and communicating. A few minutes of Jesus once a week isn’t going to cut it for your kids. Christ and His Word must be at home in their hearts because of its constant presence in your home and all along the way of life. Pray together. Take a walk and talk about the Scripture. Talk about the sermon or the children’s church lesson on the way home from church. Ask questions to see where your children are in God. What did they see and hear? What did God speak to them? Tell your children about the areas where you have failed or fallen short, and how God’s love and grace forgave you and restored you. In every area, work to shape the spirit and values you want to see in your kids. Please, start doing it sooner rather than later. I read a fascinating piece about the famous drug lord, Pablo Escobar. As one of the world’s foremost cocaine suppliers, he earned an estimated 22 billion dollars per year. This ruthless criminal was responsible for the deaths of many of his enemies, as well as police and politicians. The anomaly is that he was also a loving father, affectionate and encouraging to his own son and daughter. This dichotomy of Escobar – loving dad and ruthless criminal – is chronicled in the book written by his son, Sebastian Marroquin: Pablo Escobar, My Father. Marroquin dedicates the book “to my father, who showed me what path not to take.” What a sobering statement. All the riches showered on his kids could not make up for the poor example he set. The loving words he offered them could not eliminate the pain he caused. Affection for our kids is not enough. Providing for them financially is also insufficient. Those parents in the Bible who had the most impact were those who helped their children find God’s purpose. Hebrews 11:23 says, “By faith Moses' parents hid him for three months when he was born. They saw that God had given them an unusual child, and they were not afraid to disobey the king's command.” Somehow, God’s purpose found its way into Moses’ DNA, and his parents recognized that. Years later, he identified definitely and unequivocally with God’s people and purpose. The latter bookend is found in those regal words of Jesus as He stood before the Roman governor Pilate: “For this purpose I was born and for this purpose I have come into the world— to bear witness to the truth. Everyone who is of the truth listens to my voice" (John 18:37). Clearly, at both the beginning and the end of Christ’s life, He was guided by the North Star of God’s purpose. Life is not easy, but confidence and perseverance springs from knowing that God has a special something we are here to accomplish. One of the maladies plaguing today’s society in epidemic proportions is fatherlessness. We have a desperate need of clarity, focus, and emphasis on the importance of manhood and fatherhood. We can learn a great deal about the crucial role of fathers by studying God’s role at Jesus’ baptism in Matthew 3:17. First, Father God is present and acknowledges His Son: “This is my Son.” Make no mistake: He belongs to Me. This declaration brings identity and a sense of belonging. Secondly, the Father expresses his love for His Son: “This is my Son whom I love.” These were not just words of sentiment, but a tangible expression of love seen throughout the Gospels. Those are life-giving words! I find this phrase amazing! It comes before Jesus had preached His first sermon, before He healed His first sick person, before He cast out any demons, before He called any disciples, before He died on the Cross or rose from the grave. Affirmation is a powerful force that makes a difference in men’s lives. Use it liberally. The father’s role is to shepherd his child into discovering God’s purpose. A man who is present, a man who will pray and make regular deposits of God’s Word in his heart, a man who will be devoted to his children and to his God, will help his child taste something of God’s kingdom and glory. The good news is that even if your earthly father was absent and failed you, God will not. He promises to be the father you always wanted and needed. He can touch the pain in your heart and pour out love’s mercy to heal your deepest wounds. So, a practical question arises: Should parents force their children to go to church when they don’t want to? 1. To teach the church’s purpose. Ideally, we should all want to go to church, but we also go because we need to. We are sinful, forgetful people who need to remember who God is and be encouraged by His promises. 2. To put feelings in their proper place. If we tell our kids they don’t have to go if they don’t want to, we make their feelings their masters. By taking them, you teach them that we walk by faith, not by sight (or feelings). 3. To exercise your own faith. 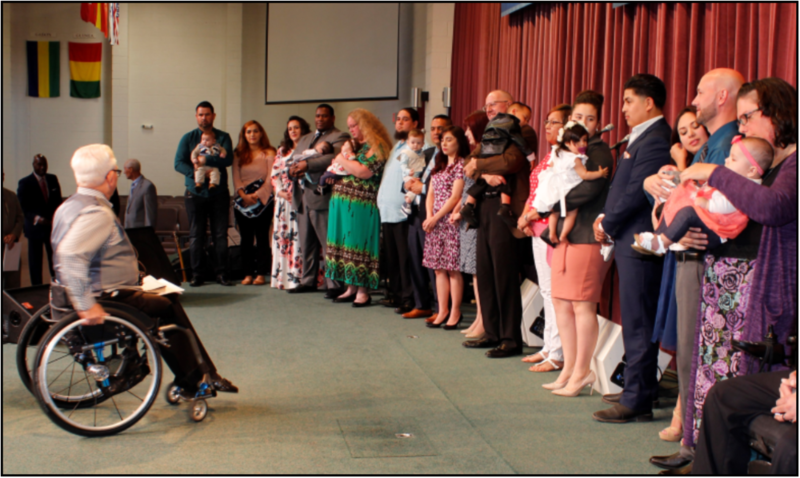 We are trusting that as we saturate our child in the things of God and the preaching of the Gospel, that God will use those moments to bring about an awakening of their hearts for Him. 4. To feed the right appetite. We are feeding the appetite for godliness. It’s one spoonful at a time, to be sure, and covered with prayer that the Holy Spirit would do His heart-changing work, but what we feed will grow. Yes, there are countless excuses for neglecting church, but meeting weekly to celebrate Jesus with songs, prayers, worship, and fellowship is important. In Psalm 122:1;4, David exclaims, “I was glad when they said to me, ‘Let us go to the house of the Lord.’” As for Jesus, “He went to Nazareth, where had been brought up, and on the Sabbath day he went into the synagogue, as was his custom (Luke 4:16). I’ve always carried a vision for the power and influence of kids who will pursue God’s purpose as Daniel and his friends did in Babylon. They were prisoners of war, schooled in Babylonian culture and given Babylonian names – all for express purpose of obliterating any distinction of Jehovah God from their lives. That’s kingdom math: ten times more capable! This is the kind of testimony that our confused, corrupt and lost world needs today. And where does it begin? Where can it be found? With you and your house.